My Self Proclaimed Challenge – Homemade Everything! It started a few years back – you know, you run out of some ingredient and you have to either find a substitute or go without. Where I live, the closest grocery store is a half-hour away. With fuel over $3.00 a gallon, I figure a trip has to be very necessary at that price – so homemade became my motto. About five years ago, I vowed to avoid processed food. Living on a farm with a great big garden made that really easy. I don't eat every meal good, but at least five out of seven is healthy, homegrown, and without preservatives. I challenge myself each time I go to the grocery store to see what aisle I can avoid. Haven't seen anything in the freezer aisle for years….because it is all processed food. If I am hungry for waffles, I make my own from scratch. I know… I understand that I do not have to leave home for an 8 to 5 job anymore so I have time to live this way, but I also think I would still get up early to keep this style of living even if I had to be out the door to punch a clock. In the next few posts, I thought I would share a few more reasons to avoid buying prepackaged items. Usually, you can make a batch of glass cleaner, non-abrasive cleaner or laundry detergent for pennies on the dollar AND make a large batch while you're at it. You spend the time to make a big batch of laundry detergent and you are set for months. So here's a few ideas for your own homemade fabric softener – perhaps one of them will fit your lifestyle! First option: crumple a few balls of aluminum foil and place in the dryer with a load of clothes. As crazy as that sounds, the metal dissipates the charges that build up between the fabric as it flops around in the dryer. Second option: plain old vinegar to the final rinse water. It will not only take the leftover soap out of your clothes, but also helps to clean washers and drain hoses too! You do not the risk of smelling like a pickle from using vinegar – when your clothes are dry, the smell has dissipated. If you insist, you can add 10-20 drops of an essential oil (eucalyptus or lavender for example) to the vinegar. So – here are a few ideas for you to start you off! Many more to follow. If you have a great homemade, no preservative, no processed, no artificial anything you'd like to share – let me know! Where we live, it's a long trip to the grocery store – when we run out of something, it simply goes on a list. When the list is long enough or the need outweighs the waiting – you go buy the stuff on the “list”. So, partly because of this and partly because I am a do-it-yourself'er, I am always on the alert for simple ways to skip a few aisles at the grocery store. I had so many comments on the window washing solution in my last post, I thought I would share a few of the other cleaning products that I make and use. Be on the watch for future posts – there are a lot that I will post at a later date. Ever used the product that you drop into your garbage disposal to clean it up and make it smell better? I have – it works great. One type makes this blue foam that swells up into the sink – when it disappears down the drain, your disposal is clean. 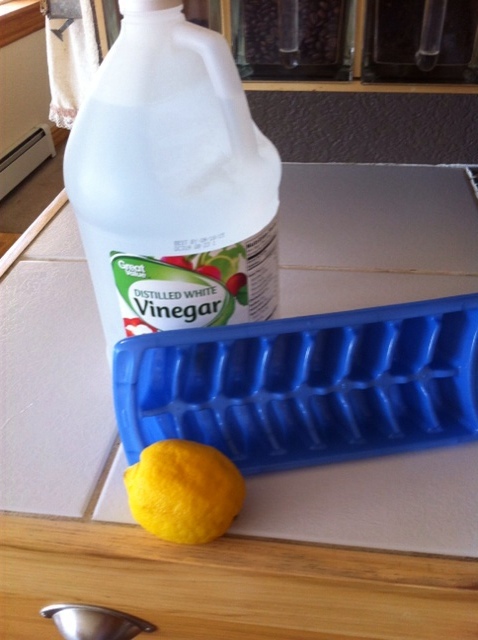 But if you have a lemon, some white vinegar and an ice cube tray, you can make your own cleaner for mere pennies. Simply slice the lemon into small pieces (including the rind), and drop them into an ice cube tray. Fill with vinegar and freeze. When your disposal needs a cleaning, use a couple cubes with the water running. 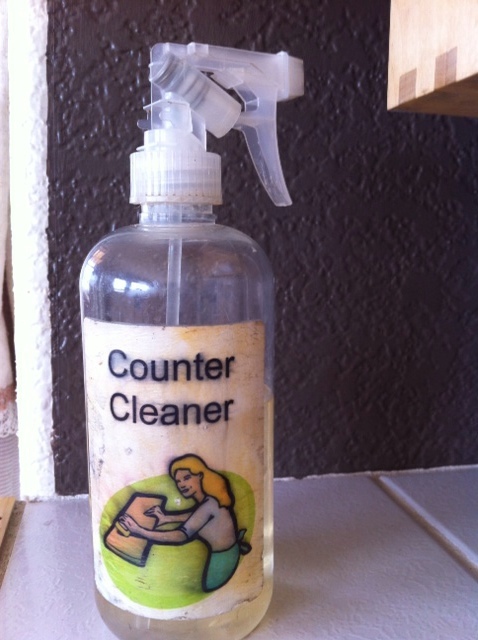 Counter cleaner is another favorite. This homemade product smells great, costs very little and kills germs! We use one gallon of distilled water, 2 teaspoons of washing soda (this is not baking soda – look for washing soda!) 1 teaspoon liquid soap, and 1/4 teaspoon of essential oil. For years I have used a combination of tea tree oil, lavender oil, thyme oil and lemon oil. The antibacterial qualities of these essential oils will help keep your counters clean and germ free. You end up with a gallon of wonderful spray cleaner that will last a long time! This laundry soap recipe has been shared by many – but just in case you missed it – this one works great! There are two ways to make the detergent – and I prefer the “dry” version because of the amount of storage space the “wet” version requires. Figured I didn't need to store “water”! 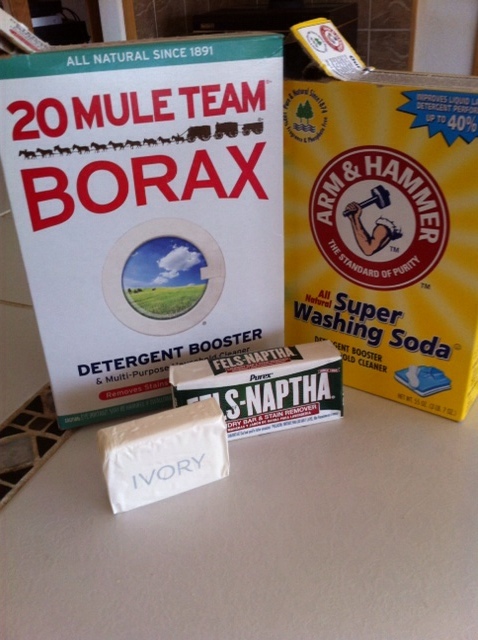 I simply combine one and a half cups of washing soda with a half cup of borax. Then add one bar of either Fels Naptha soap (grated) or one bar of Ivory to the washing soda/borax mixture. Use 1 tablespoon for regular loads and 2 tablespoons for heavy loads. Note: I soak the majority of my grease-laden clothes for 8 hours or so and also add a couple of teaspoons of lemon or orange essential oils to help cut the grease. Depending on how fine you grate the soap, this extra soaking time also allows the soap to melt. Besides saving you money at the grocery store, these products keep you away from harmful toxins that are in many household products. Consider this – essential oils are an economical way to disinfect, clean, and deodorize. Thyme oil kills strep and staff on surfaces, lavender and rosemary are antibacterial, anti-infectious and anti-viral. Lemon oil kills strep and staff in the air and is great for cutting grease. Use equal parts eucalyptus, tea tree and lavender oils for air fresheners. Simple products, natural products. Simple! Besides saving you money at the grocery store, these products keep you away from harmful toxins that are in many household products. Consider this – essential oils are an economical way to disinfect, clean, and deodorize. Thyme oil kills strep and staff on surfaces, lavender and rosemary are anti-bacterial, anti-infectious and anti-viral. Lemon oil kills strep and staff in the air and is great for cutting grease. Use equal parts eucalyptus, tea tree and lavender oils for air fresheners. Simple products, natural products. Simple!